If you’re excited about the next mainline entry in The Elder Scrolls, you’re in for a long wait. 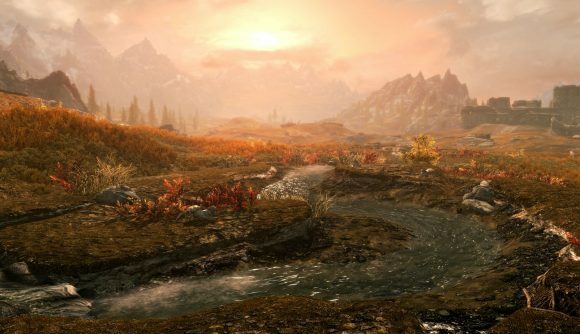 The Elder Scrolls VI, which Bethesda announced at E3 this year, won’t be showing up on this console generation, and it’ll be coming sometime after Starfield, which is also a long way off. GameSpot spoke with ZeniMax Online Studios game director Matt Firor at PAX Australia Friday, and the question of a release date for The Elder Scrolls VI naturally came up. Firor said plainly that it wouldn’t be during the Xbox One or PlayStation 4 lifecycle. “There will be a different console generation by then, I’m sure,” Firor said. Firor also indicated that The Elder Scrolls VI is behind Bethesda’s space exploration RPG Starfield in the studio’s production pipeline. The company announced Starfield at its showcase event at E3, right before teasing the next Elder Scrolls game. If you take his advice and look back at Bethesda Game Studios’ list of major releases, you see four years between Morrowind and Oblivion, then two years later (in 2008) it’s Fallout 3. Three years after Fallout 3, we got Skyrim, and then Fallout 4 four years after that. That puts us at 2015, and now, three years later, we’re getting Fallout 76 (The Elder Scrolls Online was developed by ZeniMax Online Studios). That’s about three years on average per big (non-expansion) in-house release. But that’s not a particularly helpful metric, since the last story-related Elder Scrolls game, Skyrim, is about to turn seven years old. Regardless, Firor was pretty clear that it’ll still be a few years before we see an official Elder Scrolls 6 release date. But the good news is that we’ll definitely have time to play through every version of Skyrim.